We have a new SIMPLIFIED FORM FOR YOUR ENTRIES. The Creative Arts Committee is expanding our creative activities for Convention entries this year!! JUST HAVE FUN AND BE CREATIVE!! create a chapter collage of your chapter's activities through the year. Get a tri-fold board - create a collage and enter it in our ESA Creative Art! SHOW THE STATE HOW MUCH FUN YOU HAD THIS YEAR! If you have a chapter social art work event enter your chapter's work! It can be entered as a group or individually. THIS YEAR ANYTHING GOES SO IF YOU CREATE IT .... ENTER IT!! IT WILL BE FUN! One of our talented members, Angie Fairbanks wrote a poem for the 2016-2017 State President, Jill Richards. It was read to Jill at the Kansas State Council Convention in Wichita. We want to share it and hope you enjoy it as much as our President appreciated it. It is called: "Reflections"
As I swim below the surface, I see the reflections of my life. I can't say that it's been easy, there's been quite a bit of strife. But I wouldn't want to have it any other pawsible way. It's only because of the hardships that I am who I am today. We do great works here, to help anyone in need. It's hard to believe that one day the one who needed help, was me. But I've met many friends here, and for that I will never be sorry. From Spongebob to Nemo and even absent-minded Dory. My kids are all grown up now, and they each have kids of their own. Oh how I love my ocean, the place that we all call home. Sometimes we may flounder, and we might just lose our knack. But I am so grateful that someone made a difference, and decided to throw me back. Association of the Arts are ready to celebrate your talents this year. 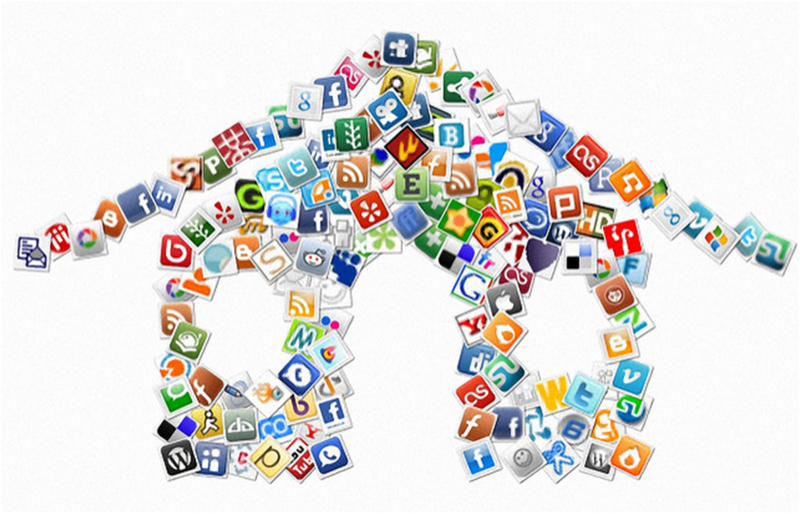 We hope you will feel free to send photos of your art work or samples so we can feature them on our site space. After the August board meeting we will be posting our plans for the year and hope that you will get involved in the "arts" with us. 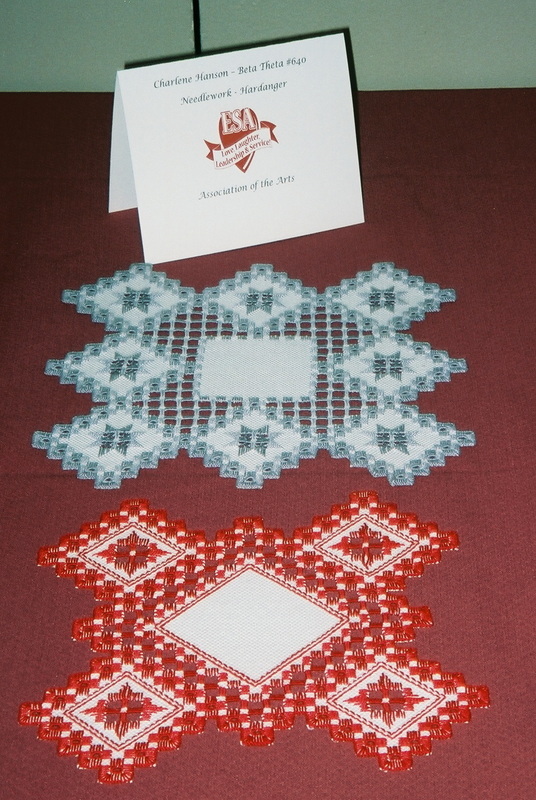 Fast becoming a lost art, Charlene Hansen displays her hardanger stitch work. It is a small fine stitch which is absolute beautiful when finished. Charlene is always an award winner in our Association of the Arts at convention. Delgene shows off a homemade tote that won first place. Using our art talent to preserve family history: Rachel Livermore put some precious memories together that belonged to her grandmother, her sister, their mother and their grandmother. 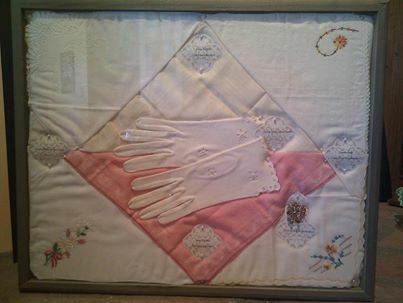 Her great aunt and great great grandmother did the tatting & hand embroidery on their handkerchiefs. This combines the talents of Rachel's family members with her ability to mount them under glass to preserve them for the family. 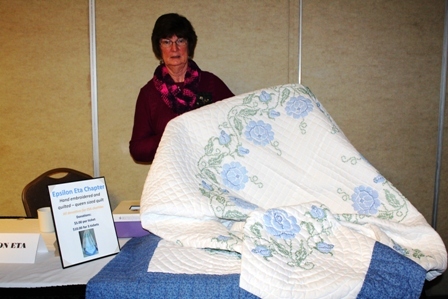 Joy Thornbrugh has an outstanding quilting talent along with many other ESA members. Has anyone seen my Shadow? We hope you are planning to enter a project in the Association of the Arts at the annual convention this May. We would also be very interested in featuring your talents on this site page even if you don't enter one of your projects at convention.